"Best Pizza in Bozeman by a mile. Many local and organic ingredients. GF and vegan options. Live music 3 or 4 nights a week. Fun atmosphere and great service. I hear a lot of people complain that its a little more expensive than your average pizza place, which makes sense because this is not your average pizza place. Quality ingredients aren't cheap, but its still the cheapest dinner of this quality that you're going to get in town." "Mom and I ordered the Waldorf pizza to go... Holy moly is it delicious! I'm not even done eating but I had to stop and write this review! The crust is thin and crispy, it has just the right amount of sauce, and all the toppings are fresh and delicious! The candied walnuts and honey drizzle are the perfect finish! Despite the sweet elements, this still tastes like dinner, and not dessert! Soo good, we 100% recommend!" "THE BEST!!!! Yelpers complaining that it's not NY Style should consider the fact that Red Tractor uses only the absolute finest ingredients. Hey! lived in NYC for 16 years and love a NY "slice" when I'm there but it ain't organic! Does organic, non-GMO food cost more than food filled with growth hormones and Monsanto-enhanced ingredients? YES. Does supporting our local farmers mean that Red Tractor has a heart and soul? You bet! For those who complain about the gluten-free crust: please understand what gluten is and what it does to baked goods and pizza dough. Many people are gluten intolerant and are accustomed to textural differences. Come and support the good food and good karma here!" 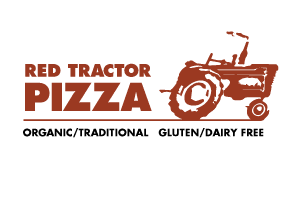 "We LOVE Red Tractor pizza! DELISH and are allergy friendly!! It's one of those places makes you feel like you are in a different town traveling. It's fun, funky and the pizza is AMAZING! YUMMMY! Our favorite is The Verdante pizza. Oh so delish! We hit it up some nights after our kids are done with swimteam. The kids love the place! Watching the hand tossing of the crust is super fun. I really appreciate how awesome they are with the ingredients they pick and that my kiddo who can't have dairy eats a yummy pizza and loves it without worrying about her allergy! Support this awesome pizza shop! You can't go wrong here! They use local ingredients, are allergy friendly, and have a fun atmosphere and the best part is the amazing pizza!"